Women saw me as their lucky charm. Once they knew me, it wasn’t long before they became engaged—to someone else. One by one, my seatmates at Singles Table 3 delivered an awkward Who-Am-I. But I barely heard them. My mind’s eye was recalling the image of Mimi whispering to her waiting groom, one hour before, as she neared the canopy. A groom who might have been me. During my early to mid thirties, I played Julia to a bevy of Camerons. I dated or befriended a parade of wounded birds who had lost their trust in men and looked to me to restore it. My effect was magnetic: I either attracted them toward some new sap or repelled them into the arms of an old flame. 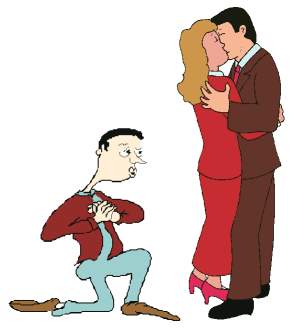 A pathetic-looking man on bended knee watches as the woman he loves kisses a handsome, tall man. In turn, each platonic paramour gushed over our easy intimacy. “I never knew I could feel this open and comfortable with a man who isn’t gay!” Just what a stud would want to hear. Did I need a shot of testosterone? A swig of ginseng tea? One siren proposed I join her sometime for a nap. In her eyes and theirs, I was “sweet,” or worse, “safe.” I didn’t want to be safe. Safe guys finish last. I had learned that dating Beth. “I’d love that,” came her soft reply. I established that we were both divorced, left-handed vegetarians, communitarian in outlook, and fans of Peck’s The Road Less Traveled and home birth. Not bad for three minutes’ work. Beyond our common ground lay an uncanny physical coincidence. In my jacket was a snapshot of me in a home furnishing store, posing eyes-shut before an immense poster. In the poster, a woman was leaning over to gently kiss a sleeping man. I looked exactly like the sleeper. And lovely Beth was the spit and image of the kisser. The author posing in 1987 by the Brandon's poster (Atlanta) where "Beth" was kissing "Paul"
Devoutly hoping that life might imitate art, after the ceremony I asked to see her again. “But Paul,” she replied, “you’re Orthodox. You can’t marry a shiksa; you said so yourself.” What was I thinking? Her call never came. In time, I forgot her. Then, one Saturday, I was in my synagogue’s social hall, schmoozing after the Sabbath service. Across the room, I espied a regal beauty standing alone. Better move fast. My honeyed words worked their devilish charm. Before long, Beth and I had shared two dinners and a movie. We could recite the names of each other’s various exes, in sequence. In quick succession, Beth begot Gina (who met Mr. Right after our second date), who begot Leah (who accepted her best friend’s proposal after our third date), who begot Eleanor (who became betrothed to her long-distance beau a week after we shared a private midnight swim), who begot Grace (said “Yes” to her two-year boyfriend six weeks into our Harry-and-Sally friendship). I made a career of attending my best friends’ weddings. Serving as their wedding photographer. Writing and performing songs for the happy couple. Helping the bride load leftover braised chicken into my car to deliver, still warm, to a homeless shelter. All in a nuptials’ work. Now, against all odds, it was Mimi’s turn. Mimi, who had grown plump so smooth-talking cads wouldn’t prey on her. Mimi, with whom I’d shared marathon long-distance colloquies that touched our deepest chords. Mimi, who, upon meeting me, “knew” I was her intended. Mimi, who, six months later, met him. Ting-ting. The spoon lady was politely reminding me it was my turn to embarrass myself. Levy was still Mimi’s groom. But there was no doubt who was the guest of honor.